When the bright colors of spring failed to appear after winter one year, the fairies wanted to find them and bring them back to earth. How did they manage? 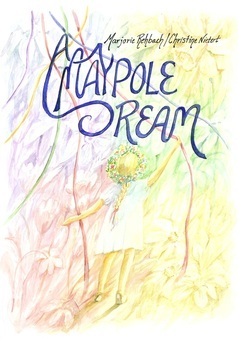 Walking through the woods, one spring morning, the story of “A Maypole Dream” appeared, as a gift, to the author. It is a tale which brings gratitude for the nature spirits back into our celebrations of the miracles of the seasons. The book contains this story and beautiful illustrations, and can be enjoyed by young and old – all those who love the weaving colored ribbons of the Maypole dance! Paperback book. $14.95 (USD) per copy plus shipping. Copyright by Sophia Institute Publishing (Standard Copyright License). 1st Edition. Publisher: Sophia Institute Publishing. Published: May 11, 2009. Language: English. Pages: 16. Binding: Saddle-stitch Paperback. Interior Ink: Full color. Weight: 0.32 lbs. Dimensions (inches): 8.5 wide x 11 tall. To see samples of the artwork included in this book. watch the slideshow below.